The people listed below have provided the greatest influence to me on the meaning and value of photographic art. Without their influences, I would not have had the courage to begin my pursuit of the elusive ideal of creating art. It is only now, after years of disappointing failures and triumphant discoveries, that I can truly appreciate their value and influence on my life. Galen was my first exposure to photography as art. I discovered the articles on his website, mountainlight.com , spoke to my soul as I dreamed of becoming an artist of photography rather than a recorder of the moment. As a former runner, I also connected with him as an athlete. My first exposure to the value of photography composition and the role of photography as art rather than only technical excellence came as I devoured Brooks Jensen’s early podcasts . LensWork magazine became my photographic ideal as I discovered how others learned and viewed art. I learned through Alain’s website, beautiful-landscape.com , articles and essays about how to become an artist, what composition was, how to see it, and how to begin to develop my own voice within it. I learned through Michael’s website, luminous-landscape.com , articles and forum about how the technical aspects of photography can free the artistic and compositional ideas we struggle to release as creators of vision. He also taught me one-on-one about the value of technical discipline. George’s blog was the first photographic blog, at georgebarr.com , that I discovered. I read every single entry from start to finish and watched how he developed his art and discovered his abstractions. I later modeled my blog after his spirit of discovery and artistic journey. Jay Maisel’s architectural composition work taught me about one of the many faces of photographic art that at the time I never knew existed. I was captivated by helicopter artistic excursions around New York City, and his vision and technique during the Epson Print Academy video seminars. I learned about the value of daily visual calisthenics from him. As my first mentor, Mallorie, at ostrowitzphotography.com , taught me what abstraction was, how to begin seeing it and developing it. 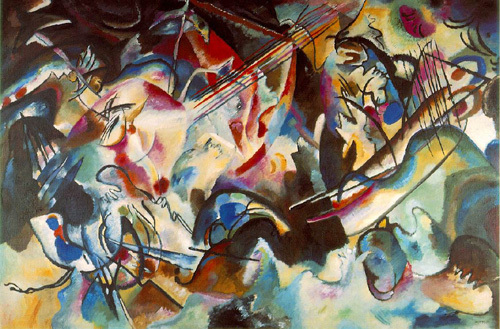 Wassily Kandinsky’s work with color as form and the importance of lines and shapes in composition memorized me. This was my first exposure to abstraction with which I connected after learning about the value of abstraction. Pictured above is his Composition #6. Jerry Uelsmann’s symbolic representations; his humor; his mastery of composition, compositry, and his spirit of inquisitiveness, became my first anchor in the world of compositry. I learned about spirituality, transcendence, and universality through symbolism, especially in his Resonance series. John Paul Caponigro taught me to be self-confident, how to take artistic risks, how to share what I learned with others, and his encouragement of a nobody like me to begin to find my own creative place in a crowded artistic world, especially through his workshops and one-on-one sessions. Paul Caponigro opened my eyes to explore our connection with the world and to always be ready for life’s surprises, as in his Running Deer, and his sense of time, place, and spirituality, especially in his Stonehenge and other stone monuments in England and Ireland.